Military Situation In Syria And Iraq On November 19, 2018 (Map Update) 4.8571428571429 out of 5 based on 7 ratings. 7 user reviews. 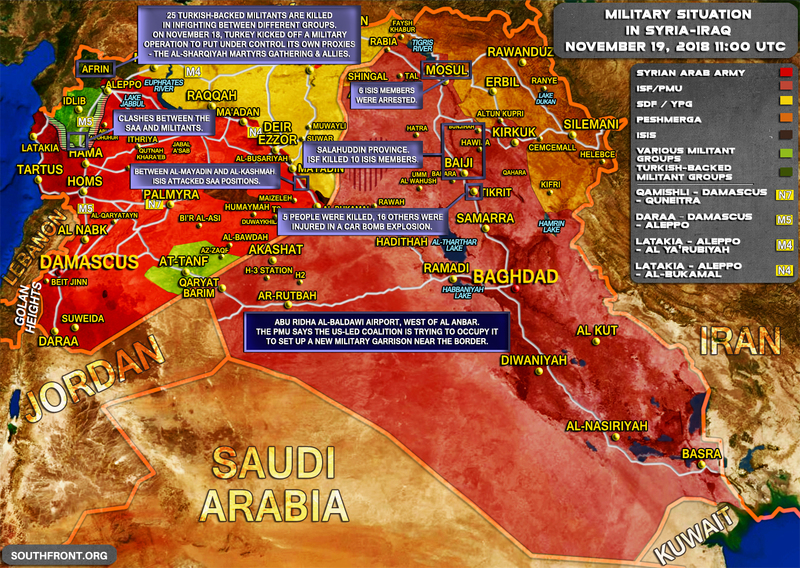 This map provides a general look at the recent security and military developments in Syria and Iraq. Over the past few days the situation has escalated in Syria. The miltiant-held area in the province of Idlib and the ISIS-held pokcet in the Euphrates Valley remain the main points of instability. Thanks to the US, nato, isreal, and some lesser states, the map looks like one big powder keg. Iraqis cannot still be under the impression that US occupation of their country has been beneficial for them. They should side with their neighbouring states now they have had a taste of the future under US and nato rule. Afghanistan also welcomed some western influence and they also got a brutal US occupation instead and a thriving heroin market. Libya too is unfinished business. US and nato’s humanitarian killing spree has put that country back decades. All these countries had their troubles imported by foreign gov’ts who were aided and abetted by their very own people. I hope the ownership of the ruins lives up to expectations. They should side with their neighboring states but they are still occupied. However the PMU’s under General Soliemani was able to overcome US interference, intuition tells me they will prevail. Iraq, Iran and Syria all are part of a formal alliance now, hezbollah from lebanon are also a part of the alliance. Iraq hasn’t asked the US for assistance for ages, if anything Iraq is the only thing saving the US from having it’s positions at Hajin in Syria overrun by Isis, Iraqi assistance is very much needed by the US at the moment, the Kurds are on strike.